Manager Michael Appleton believes Blackburn suffered a hangover from their heroic FA Cup victory over Arsenal as they went down 2-0 at Hull. Three days after their fifth-round 1-0 win at the Emirates, the defeat dented Rovers' Championship play-off hopes. "It was a worry of mine going into the game that the euphoria of Saturday might affect the performance. 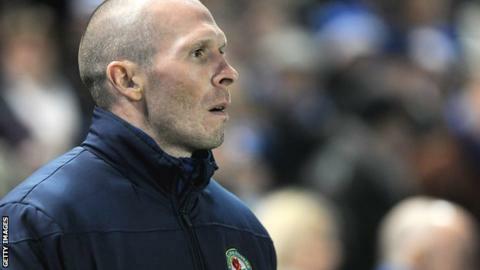 "Ultimately, for whatever reason, I think that happened," Appleton told BBC Radio Lancashire. Second-half goals from Egyptian duo Gedo and Ahmed Elmohamady condemned Blackburn to a first loss in seven games. Appleton said: "The first goal was going to be important and we didn't deal with the disappointment of conceding that first goal. "We should have stuck in there and made the game a little bit harder than it was after that. "We get the opportunity of a home game [against Leeds on Saturday] to get a good reaction from the players and I'm sure we will. "There are going to be a few ups and downs between now and the end of the season and this is certainly a down, but we had a big up on Saturday and hopefully we can have another up this coming Saturday as well." Meanwhile, Appleton said Lee Williamson's ankle injury was not as bad as first feared after he was forced from the pitch on Tuesday on a stretcher.